a teensy bit of closure and maybe a bit of light up ahead? I am feeling a bit more like myself. It’s hard to believe this is even possible barely six months after the death of Chris. I almost feel guilty…almost. Relieved is probably a better way to describe it. It’s difficult to describe how one feels after the death of a loved one. Numb, confused, forgetful, sad, depressed. It does feel like some of this is lifting just a bit…and the relief that comes with it is…well…it’s really nice. 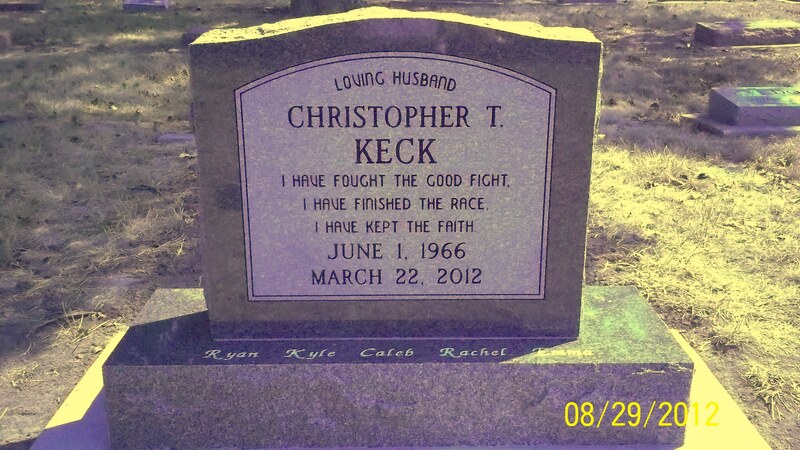 Some of the closure I feel is that Chris’s headstone was finally placed this last week. I really like it, well, as much as you can like a headstone. It describes him well. This part of the grieving process..the funeral and burial is now officially over, I do not have to revisit this part of the process again. That is a good feeling. As a family it seems we are settling into a different kind of normal. It still seems empty in so many ways but it is bearable. It seems contradictory to miss someone so much but yet continue your life without them. Somehow it seems wrong, but it is the way of things in this life. I have my doubts that the missing him and lonely feeling will ever go away. That must be the “limp” we have that comes from suffering, and pushes us to depending more on Him. I’m sure I will still keep cycling through the stages of grief for some time to come, but for now I am thankful for this small window of relief, and am praying that each cycle will be less painful than the one before it. The memories in our hearts of love ones past I feel God uses to show us that life here in the flesh is temporary, yet our hope in Christ is that we will be joined together in His glory. Okay. I’m crying again. I love this post. I’m cautiously happy for you. I LOVE the stone! Beautiful! You did good. 😀 Love you, dear friend! thanks Mel..if you’re ever this way please stay with me! been a while since we visited! Thank you, Nicole. It’s nice when some peace comes…rest in it gratefully, as I know you are doing. Thank you for posting the photograph. It is a lovely memorial. A huge grief for me is that I was not consulted about my son’s stone at all. It has only his name and the years of his birth and death, not even the dates. Every time I see it, it destroys me. It is so cold and impersonal. It is completely generic and meaningless. I am so sorry Angela…that would be heartbreaking. Making that stone and having it just right was really important to me…I can’t imagine not being able to do that. It does my heart good to read this post – so glad some encouragement and relief has come. Perfect stone for how I remember Chris! Beautiful. So thankful for your window of relief. I know many more will come because God is good. We continue to pray for you all! Nicole I am glad our Loed Jesus Christ has given you a window of relief. I am happy that you shared such personal words; I think it helps with the grieving process, My prayers are always with you and your family. Jesus loves you and so do I.